This product contains milk, soy, and egg. This product was produced in a facility that may also process ingredients containing milk, egg, soybeans, shellfish, fish, tree nuts, and peanuts. Fitmiss Protein Blend [Whey protein concentrate, L-leucine, L-isoleucine, L-valine, egg albumin, micellar casein, whey protein isolate, whey protein hydrolysate], flax seed, cocoa powder, inulin, natural & artificial flavors, calcium silicate, L-glutamine, Soalthin™ potato protein, salt, carrageenan, xanthan gum, cellulose gum, protease citrate, apple extract, artichoke leaf extract, barley grass powder, black berry fruit powder, blood orange powder, broccoli powder, cherry extract, citrus flavonoids, cranberry extract, lemon bioflavonoids, mango seed extract, pomegranate rind extract, red currant powder, spinach powder, strawberry powder, watermelon powder, wheat grass powder. Fitmiss Protein Blend [whey protein concentrate, L-leucine, L-isoleucine, L-valine, egg, albumin, micellar casein, whey protein isolate, whey protein hydrolysate], flax seed, inulin, natural and artificial flavors, calcium silicate, L-glutamine, citric acid, Solathin™ potato protein, red beet juice powder (for color), salt, carrageenan, xanthan gum, cellulose gum, protease, acesulfame potassium, sucralose, lactase, potassium citrate, apple extract. artichoke leaf extract, barley grass powder, black berry fruit powder, blood orange powder, broccoli powder, cherry extract, citrus flavonoids, cranberry extract, lemon bioflavonoids, mango seed extract, pomegranate rind extract, red currant powder, spinach powder, strawberry, watermelon powder, wheat grass powder. This product contains milk, soy and egg. This product was produced in a facility that may also process ingredients containing milk, egg, soybeans, shellfish, fish, tree nuts and peanuts. 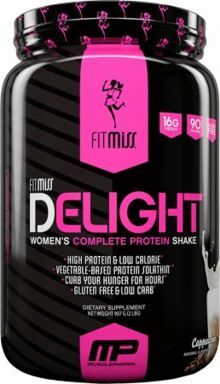 Add 1 scoop of FitMiss Delight to 8-12 oz of cold water or beverage (milk, almond milk, rice milk, juice, etc.) and ice in a blender. Blend until creamy for a frosty smoothie. This product is only intended for use by healthy adults over 18 years of age. Consult your physician before using this product if you are taking any prescription or over the counter medications or supplements. Do not use this product if you are pregnant, expect to become pregnant or are nursing. Fitmiss Protein Blend [Whey Protein Concentrate, Solathin™ Potato Protein, Egg Albumin, Micellar Casein, Whey Protein Isolate, Whey Protein Hydrolysate], Flax Seed, Natural & Artificial Flavors, Inulin, CAlcium Silicate, Carbomethylcellulose, L-Glutamine, Salt, Sucralose, Protease, Acesulfame Potassium, Lactase, Potassium Citrate, L-Leucine, L-Isoleucine, L-Valine, Apple Extract, Artichoke Leaf Extract, Barley Grass Powder, Black Berry Fruit Powder, Blood Orange Powder, Broccoli Powder, Cherry Extract, Citrus Flavonoids, Cranberry Extract, Lemon Bioflavonoids, Mango Seed Extract, Pomegranate Rind Extract, Red Currant Powder, Spinach Powder, Strawberry Powder, Watermelon Powder. ALLERGEN WARNING: Contains milk, soy, and egg. This product was produced in a facility that may also process ingredients containing milk, egg, soybeans, shellfish, fish, tree nuts, wheat and peanuts. Fitmiss Protein Blend [Whey Protein Isolate, Solathin™ Potato protein, Egg Albumin, Micellar Casein, Whey Protein Isolate, Whey Protein Hydrolysate], Flax Seed, Inulin, Carboxymethylcellulose, Natural And Artificial Flavors, Calcium Silicate, L-Glutamine, Salt, Sucralose, Protease, Acesulfame Potassium, Lactase, Potassium Citrate, L-Leucine, L-Isoleucine, L-Valine, Apple Extract, Artichoke Leaf Extract, Barley Grass Powder, Black Berry Fruit Powder, Blood Orange Powder, Broccoli Powder, Cherry Extract, Citrus Flavonoids, Cranberry Extract, Lemon Bioflavonoids, Mango Seed Extract, Pomegranate Rind Extract, Red Currant Powder, Spinach Powder, Strawberry Powder, Watermelon Powder.